As the last hours of 2010 fly past, I find myself wondering what the purpose of all the year-end recapitulation that dominates the media for much of December can be. I participate in it myself, having submitted a "best films of 2010" list and a set of reflective quotes to the sf360 website. I'm also preparing my annual multi-participant survey of the year in Frisco Bay repertory/revival screenings, which you can expect to see on this site by mid-January. Surely the main reason to reflect on a year as it passes into history is to hope the process helps us learn something we can apply to the year to come. One of the lessons I hope I've learned over the past year is that I cannot expect many of my friends to follow my example and regularly take advantage of the panopoly of filmgoing options we all have before us in this town, and that blogging or tweeting about screenings I'm anticipating is not going to create enough intertia to get people out of the habit of watching all their movies from the comfort and convenience of home. If I want the people I care about to share my appreciation of big-screen movie-watching, I should specifically invite them along on my expeditions into the cinematic wilderness, where they're certain to relish an experience they hadn't consciously realized they'd been missing. Last week I organized a group outing to Japantown's VIZ Cinema to view a great 35mm print of Akira Kurosawa's 1963 masterpiece High And Low. Most of the people I brought had never before seen this still-underappreciated kidnapper vs. detective saga, or had never been to the VIZ, or both. I don't think there was a single attendee who regretted a single dollar of the admission price, or a single minute of this extremely compelling thriller. The first hour and a half or so of the film is simply unimpeachable, especially when its wide Tohoscope images are displayed on an immersive screen. Like the Bridge and the Red Vic, the VIZ Cinema was M.I.A. from Jonathan Kiefer's list of San Francisco's remaining single-screen theatres found in his relatively-recent, otherwise-worthy SF Weekly article on the uncertain fate of Landmark's Clay. Most people I talk to about the VIZ have never heard of it, even if they're fans of Japanese filmmakers and have visited the mall in which it is located. And while attending the venue for dozens of screenings in 2010 (only the Pacific Film Archive and the Castro attracted me more often) I don't think I've ever seen it more than half-full. Thus, it was with sadness but no surprise that I reacted to news from a ticketseller that the venue would be ceasing daily operations early next year. The coming week provides opportunities to catch the end of the Kurosawa-Toshiro Mifune series, including the Seven Samurai (January 2nd only), Drunken Angel, Stray Dog, and two final showings of High And Low (Jan. 3 & 6), but the theatre then closes for ten days of maintenance, and I don't think we should expect it to continue programming films much beyond its late-month digital screenings of the anime Evangelion 1.0 and Evangelion 2.0. Any trips to the Red Vic are going to help put the theatre closer to black, but two official benefits are scheduled on the Red Vic's February calendar: a February 12 program of politically-minded underground films Bold Native and All Power To The People (a documentary on the Black Panther Party) and a February 24th multi-media event celebrating San Francisco movie theatre history, presented by Rebecca Solnit, Christian Bruno, Sam Green, Chip Lord and Julie Lindow. If you didn't get Lindow's book documenting this history, Left In The Dark, as a holiday gift, it's certainly an apropos time to buy it for yourself. I'm equally excited about the Film On Film Foundation's also-beneficial rental of the theatre for a "tripple" bill of Gumby: The Movie, The Adventures Of Mark Twain and Peter Jackson's debut Meet The Feebles. 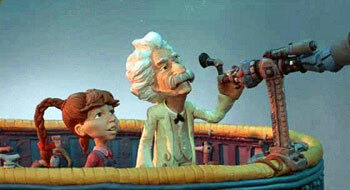 Perhaps improbably, the only one of these I've seen before, years ago, is the Adventures of Mark Twain, a feature-length Will Vinton Claymation that absolutely enchanted me when I was a jaded teenager. 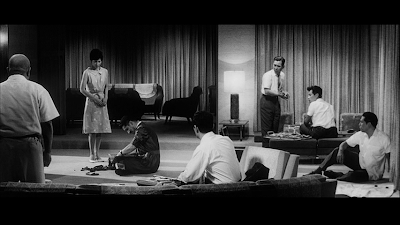 (The top image in this post is from the film.) I cannot wait to see it on the big screen and to bring some of my most jaded friends along for the ride. Advertising campaigns help film festivals and new releases attract audiences. This is why, when the Castro hasn't been four-walled by German Gems or Sketchfest or Noir City or the Silent Film Festival, that venue seems to prefer showing a mediocre (at best, imho) "re-bake" like Tron: Legacy than the kind of programming its staff excels at, but that can be a risky draw for customers, like last year's Samuel Goldwyn tribute or its upcoming set of Alfred Hitchcock's less culturally-canonized films. Sadly, repertory film is threatening to die out in this town, as it has in so many others, and the troubles of the VIZ and the Red Vic are merely the latest symptoms. There's still a great scene to be pieced together if you're willing to put in the effort of calendar-tracking (and if you regularly read my blog, you probably are). 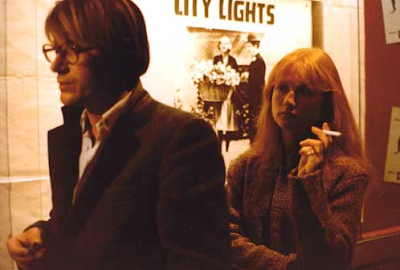 What's lacking in San Francisco is a single cinema where every day is a blast from the past. In lieu of that, most minds turn toward the home viewing option when in the mood for a movie released anytime earlier than last month. I don't know if there's realistically a way to reverse this trend. If all the Netflix subscribers who canceled their accounts in favor of a free service like the public library, used the money saved to visit a theater for a movie or two per month that they otherwise wouldn't have gone to, places like the Red Vic might thrive. I'm not much of one for New Year's Resolutions, but in 2011, I hope to share more of my favorite films and theatres with friends and acquaintences that I don't normally see at the movies. Why didn't I think of this before?